From Dec. 15, 2006 through Apr. 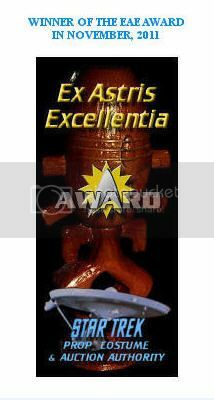 13, 2009, the California based screen used entertainment memorabilia dealer ItsAWrap! 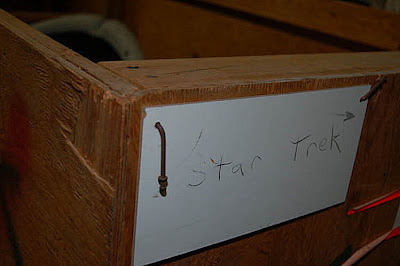 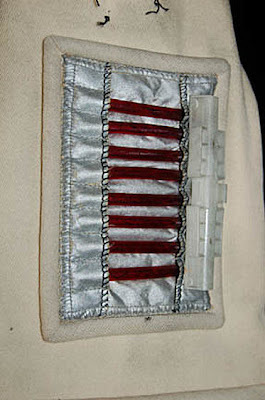 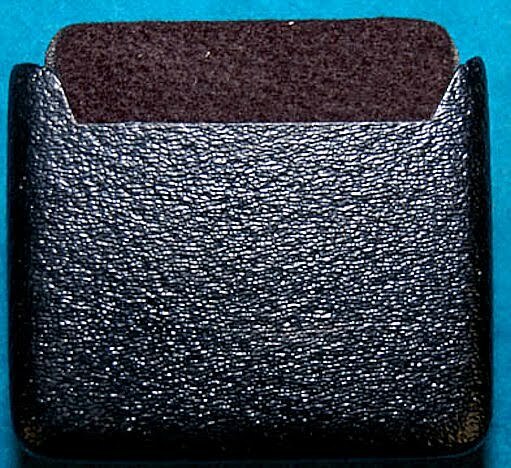 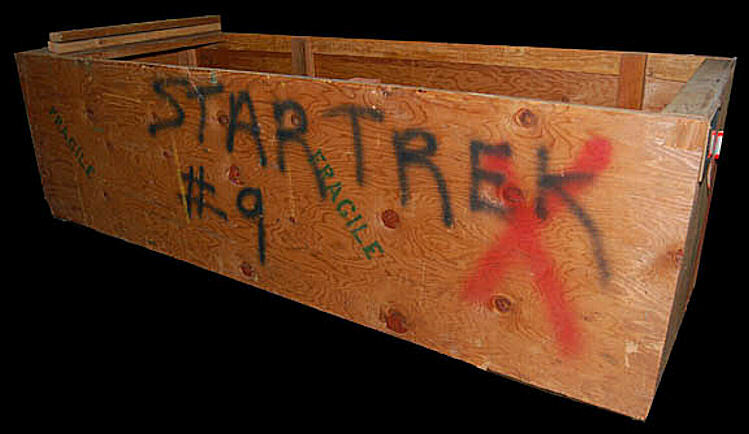 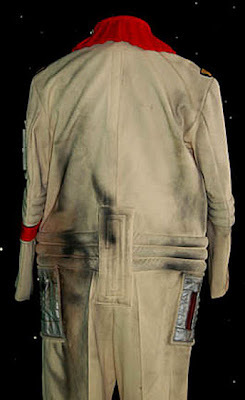 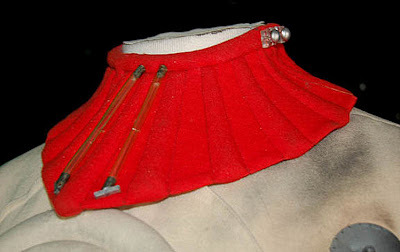 (http://www.itsawraphollywood.com) conducted a series of weekly auctions via ebay on behalf of CBS/Paramount that offered a tremendous variety of props, costumes, set fixtures, scripts and production related artifacts from the Star Trek franchise to a worldwide audience and collector base. 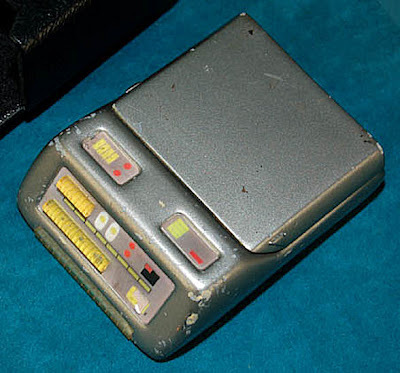 Over the course of 121 weeks, approximately 9100 unique items that spanned the first 10 Star Trek feature films and the last four television series (Star Trek: The Next Generation, Star Trek: Deep Space Nine, Star Trek: Voyager and Star Trek: Enterprise) were sold. 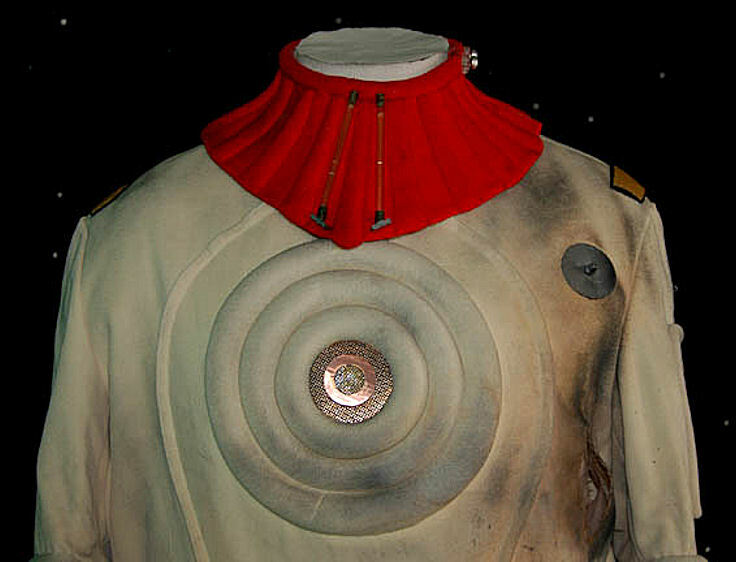 Additionally, perhaps 10 costumes from The Original Series (consisting of 4 or 5 light blue Technicians Jumpsuits, 2 pairs of Federation uniform trousers, a dark green Nilz Baris suit seen in "The Trouble with Tribbles", and 2 Tellarite jumpsuits from "Journey to Babel") were auctioned as part of the vast Paramount warehouse inventory that was dispersed. The ItsAWrap sales commenced only weeks after the historic Christie's "40 Years Of Star Trek" auction was held in October, 2006; which offered collectors a total of 1000 lots of screen used memorabilia, highlighted by a number of major starship filming models from the franchise. Presented below are several photos of different screen used Star Trek: Voyager midgrade tricorder props and accompanying holsters sold at auction by ItsAWrap. 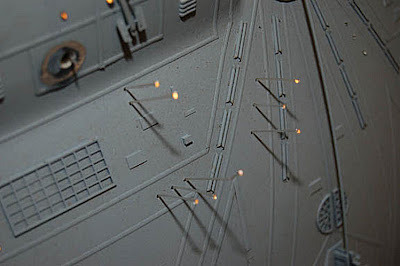 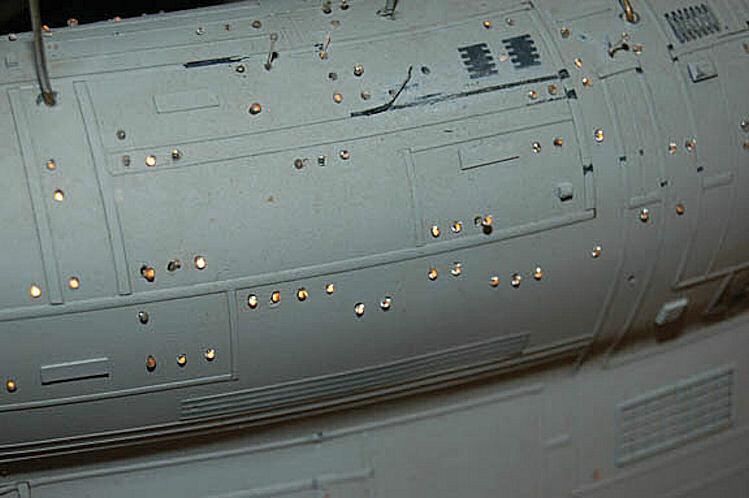 These pieces lack the internal electronics and functional lights found in the rarer "hero" props; however, are beautifully detailed with numerous graphical applications, and external plastic accents to represent the top sensor arrays. 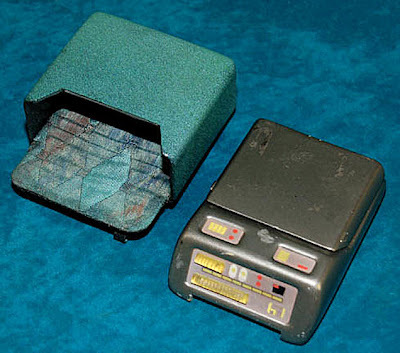 STAR TREK: VOY "TRICORDER W/HOLSTER"
A prop item featured similar to those used throughout Star Trek: Deep Space Nine and Voyager and believed to have been used by "Neelix" (Ethan Phillips) in several episodes of Voyager and features a holster that obviously belonged to him. The Tricorders were made for Starfleet as a multi-purpose scientific and technical device; all of which were fitted with cutting edge sensing equipment. 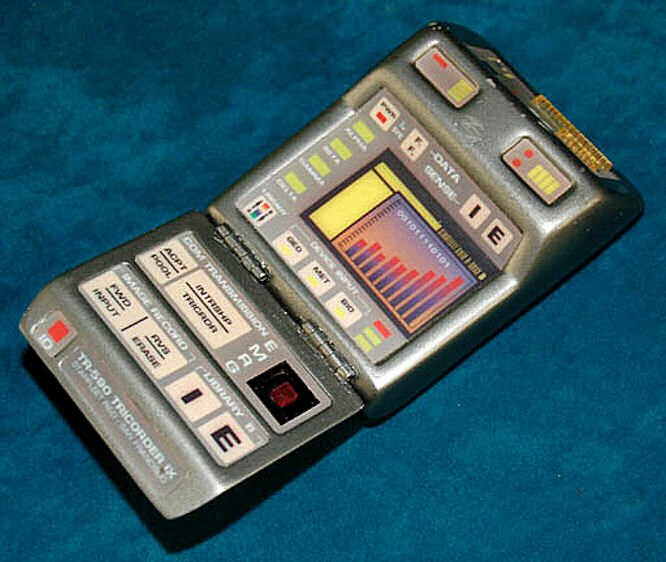 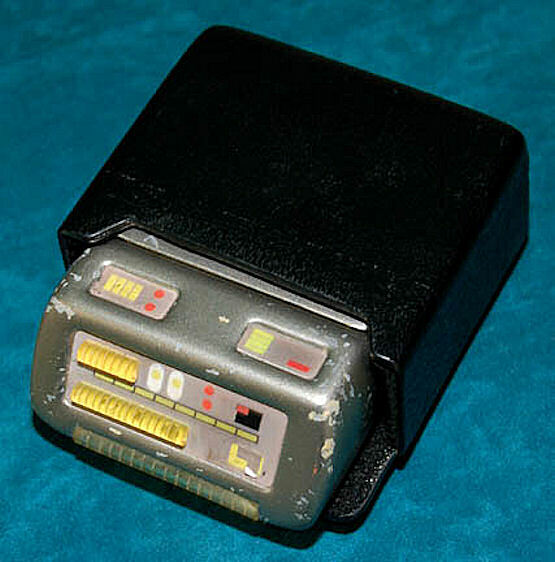 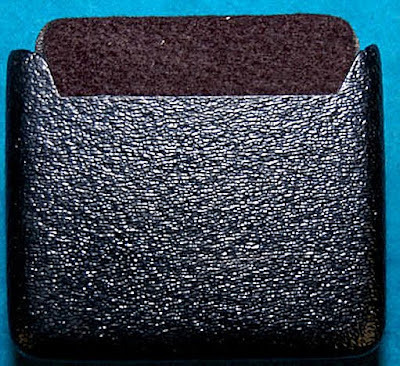 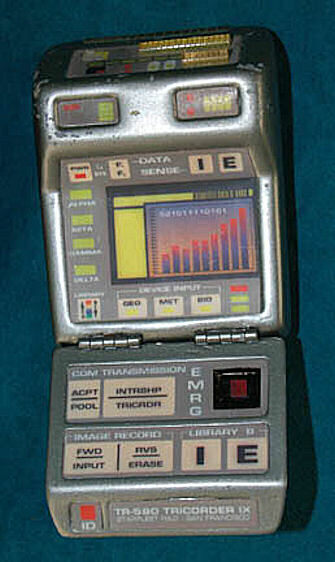 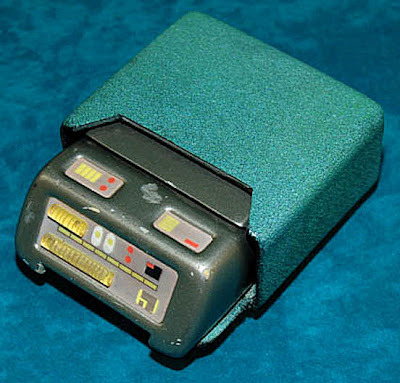 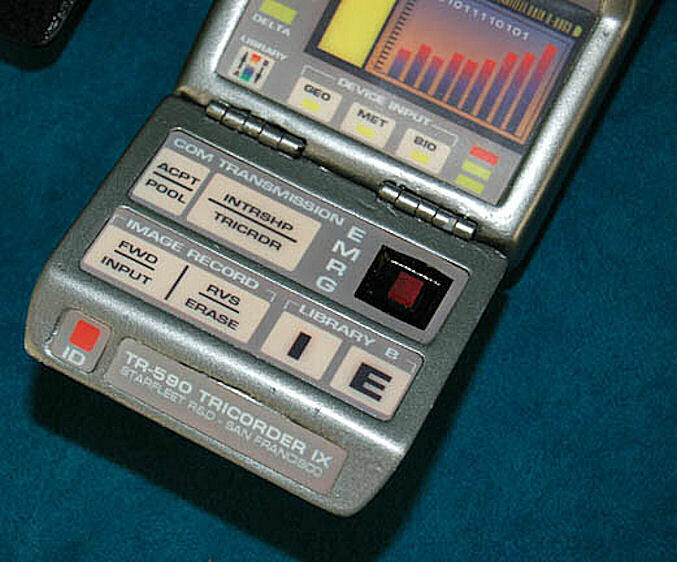 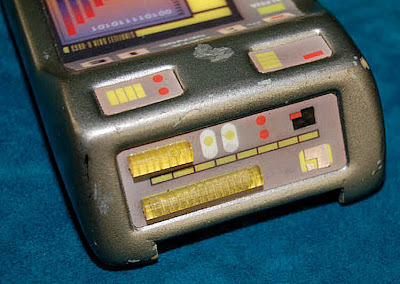 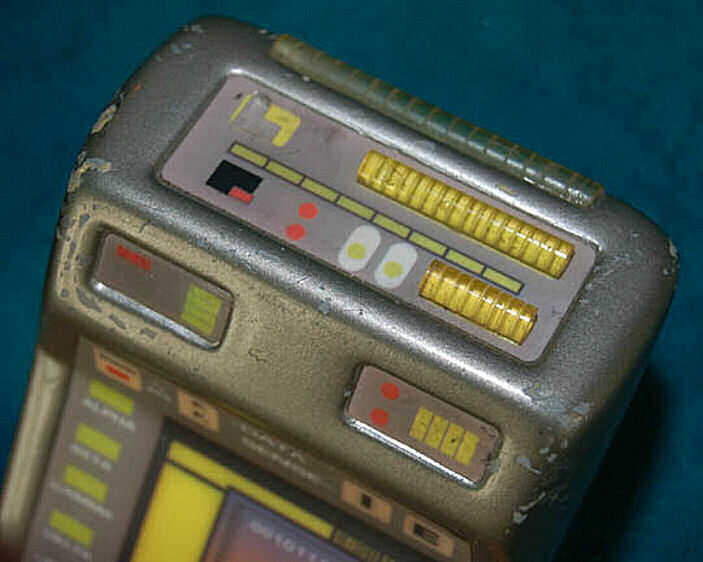 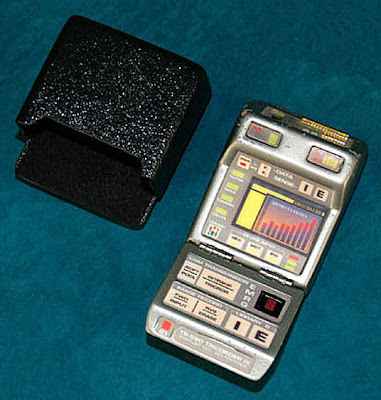 This tricorder is resin cast in gray with a flip-open design to maximize portability and incorporates graphical applications as visual displays and data interfaces, mock "button" touch pads, a label on the bottom that reads "TR-590 Tricorder IX, Starfleet R&D San Francisco", yellow plastic accents on the outside top; a molded plastic holster in a bright teal shade and metal clips for the belt are also included. 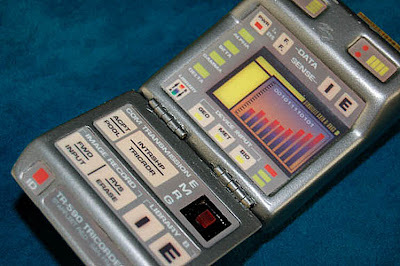 The item measures approx. 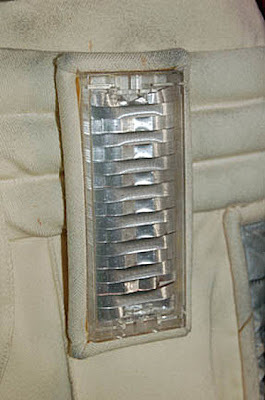 4 x 3.5 x 1.5 in the holster. Presented below are several detailed photos of a pair of screen used Star Trek Feature Style Engineering Radiological Suits sold at auction by ItsAWrap. 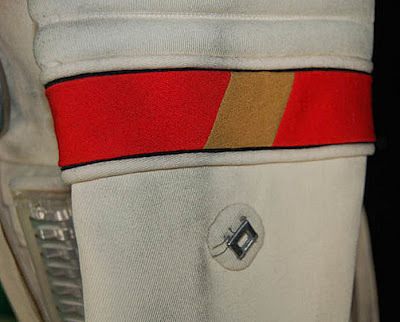 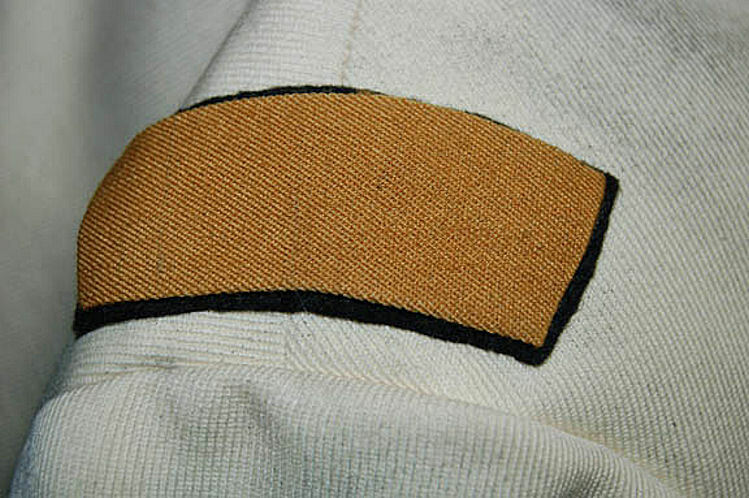 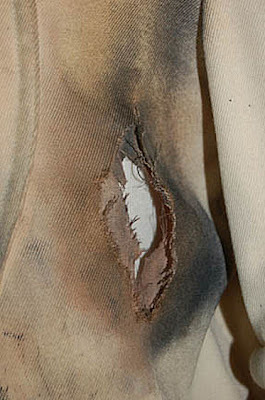 The white uniform, which was identified as a Cadet version used in Star Trek II: The Wrath of Kahn (1982), sold on Feb. 23, 2007 for a final bid of $1325. 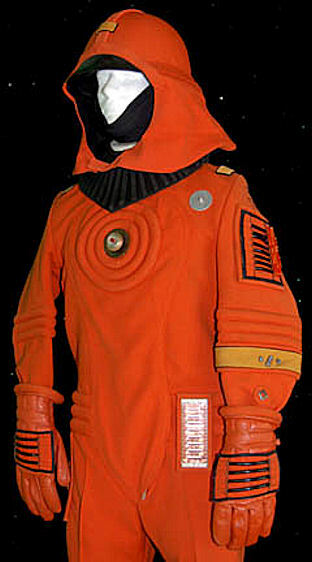 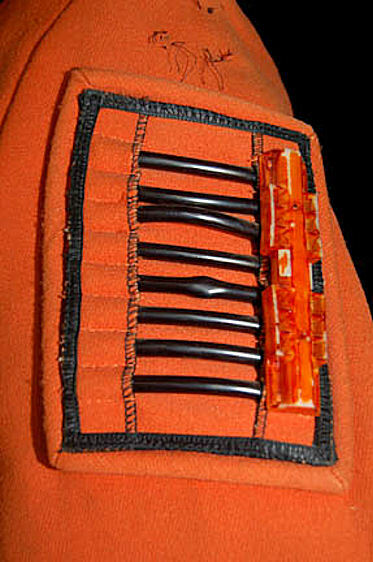 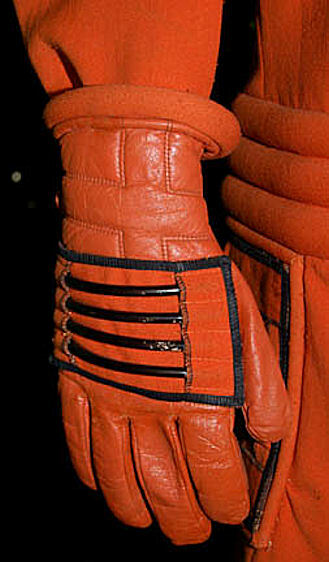 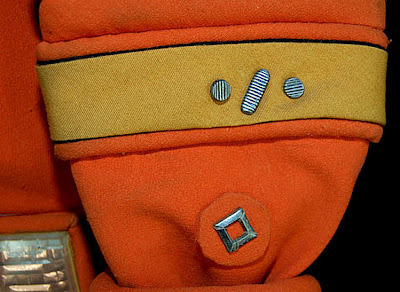 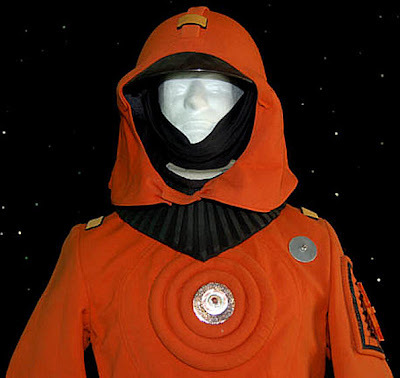 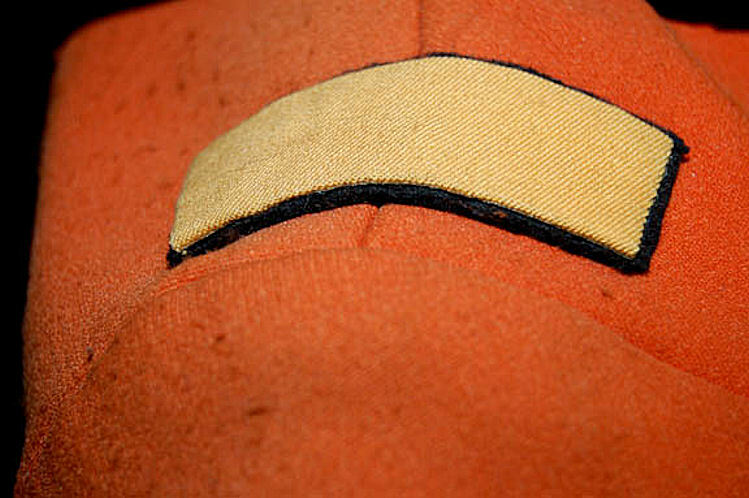 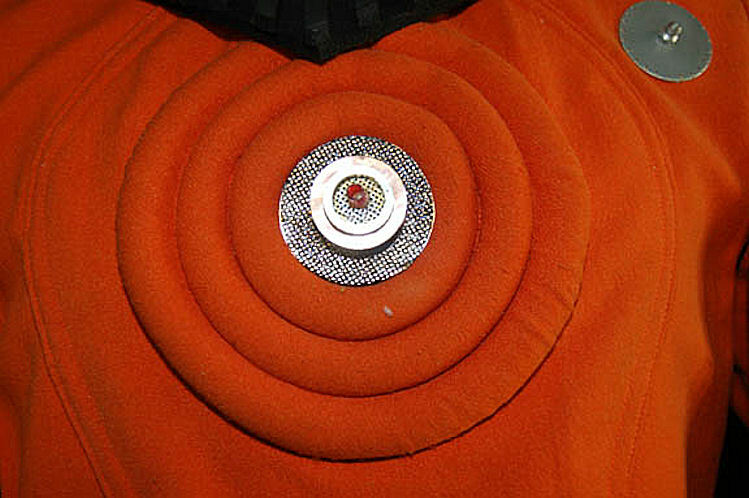 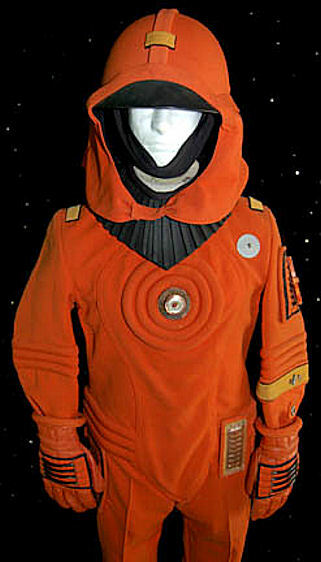 The orange suit sold on April 20, 2007 and realized a final bid of $1715. 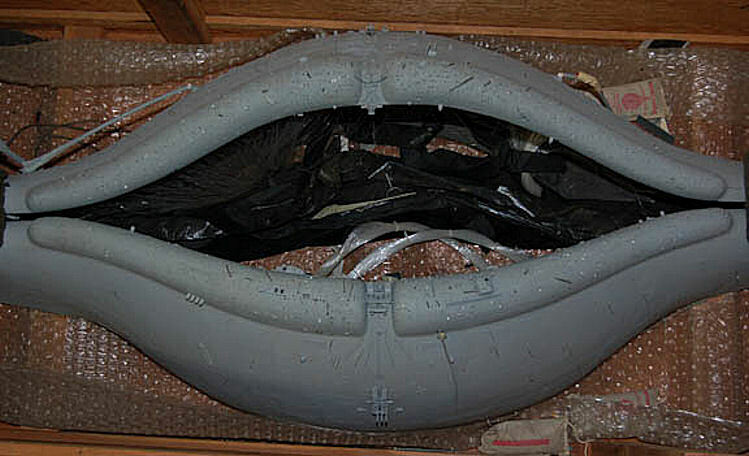 STAR TREK I:"V'GER - SPOCK MINDMELD MODEL PIECE"
A large model piece created for Star Trek I: The Motion Picture made to be part of the 'V'Ger' probe wich approached Earth. 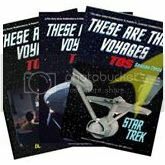 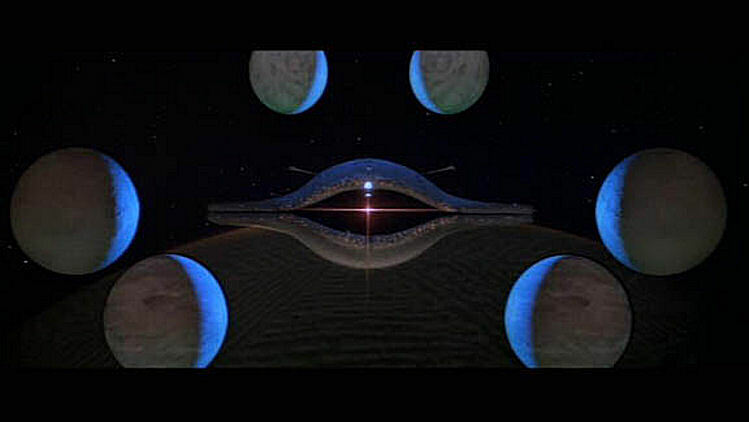 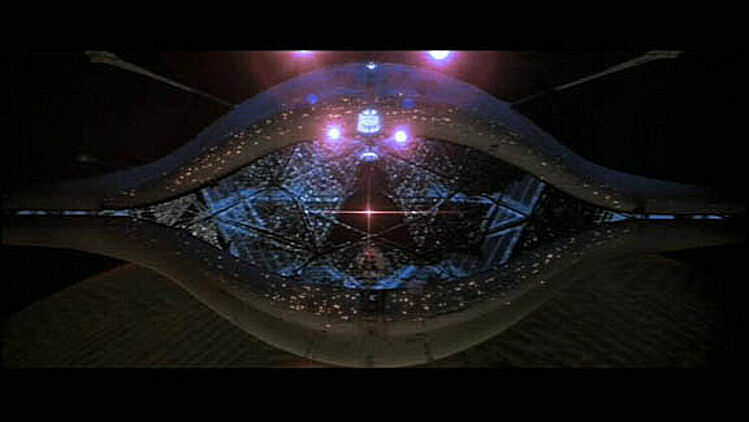 With the "USS Enterprise" held within it, Spock (Leonard Nimoy) left the ship and encountered multiple visual records of V'Ger's travels across the galaxy. 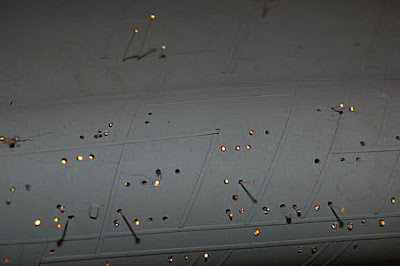 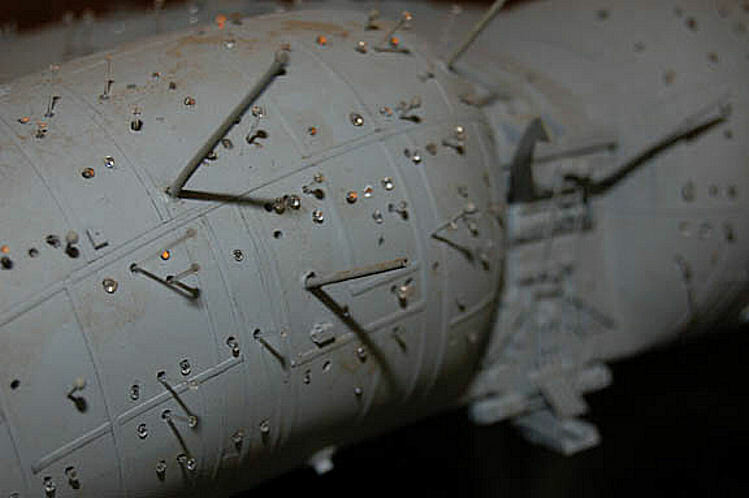 Coming upon this piece, Spock recognized a complete reconstruction of the Epsilon IX space station held within the probe, the same station V'Ger destroyed earlier in the film. 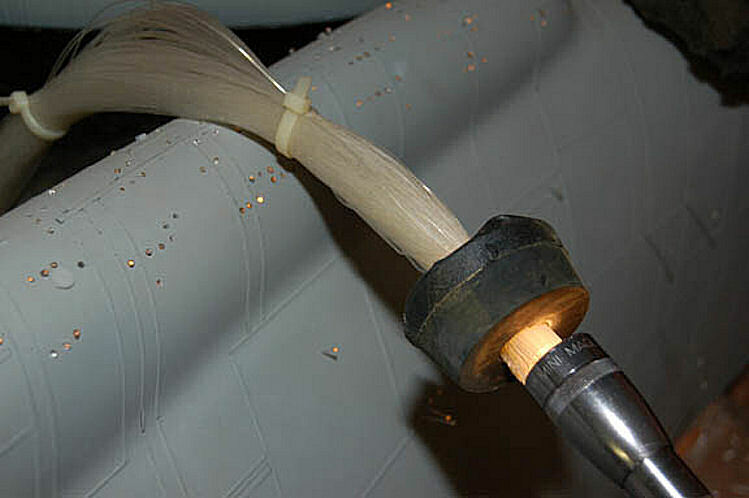 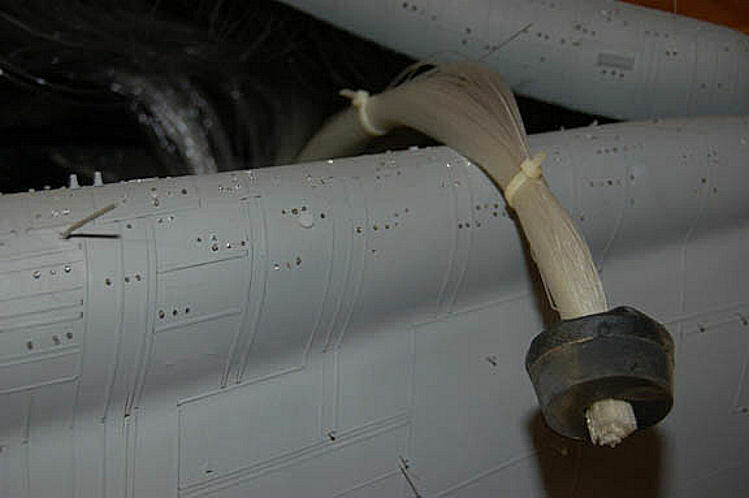 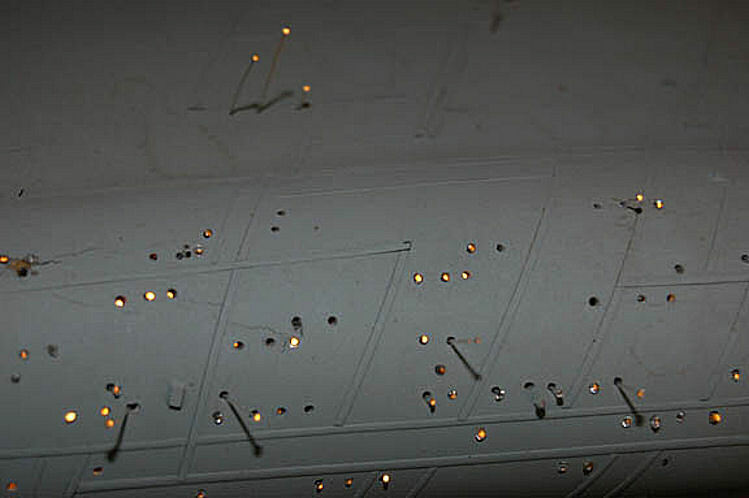 The item is a large formation of epoxy 'lips' with an incredible amount of fiber optic placements. 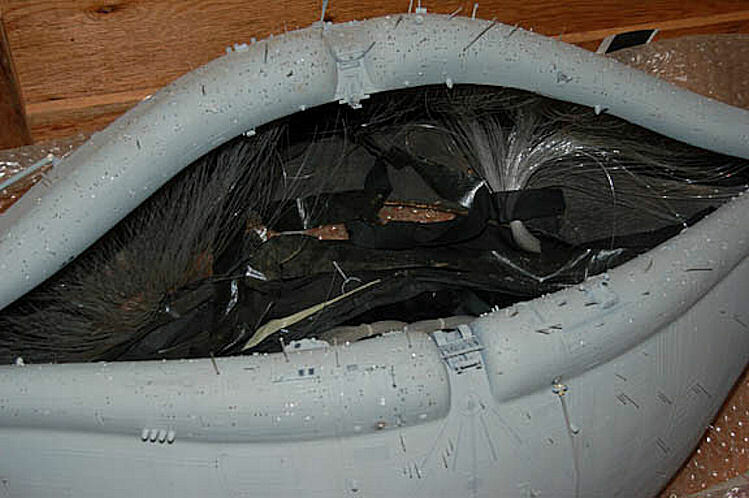 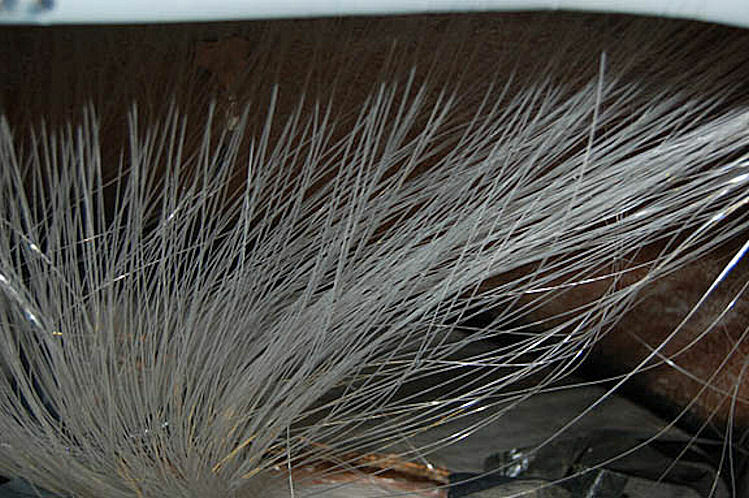 The item is gray in color, molded with excruciating detail, some more amazing in person than on screen, with a wood backing which was replaced by images of Epsilon IX while on screen, and with four separate quadrants of fiber optic cables connected to the four interconnected pieces making the item come to life when lit. By simply placing a flashlight or other illumination (not included) on any of the collected ends of the fiber optics a section of the lips will light, with a larger light source the entire piece shines with what must be hundreds of lighted windows. 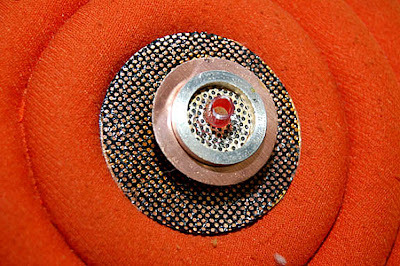 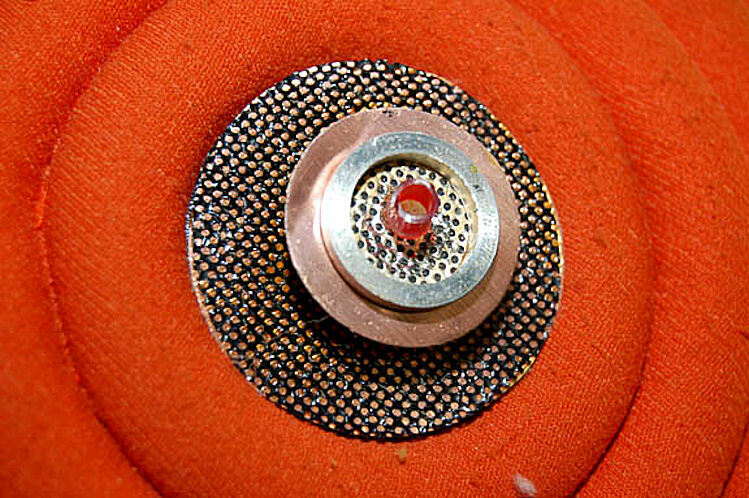 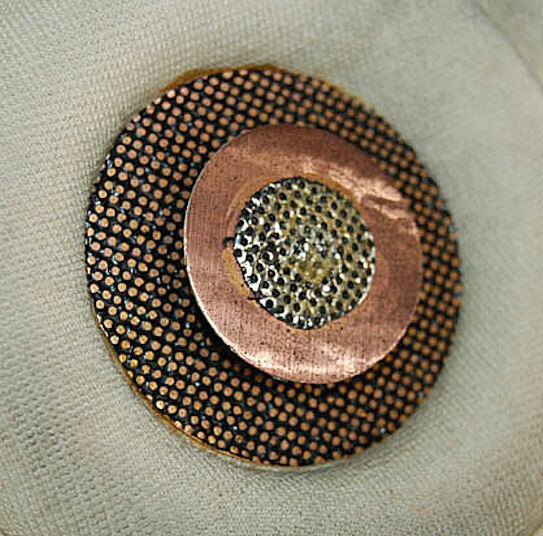 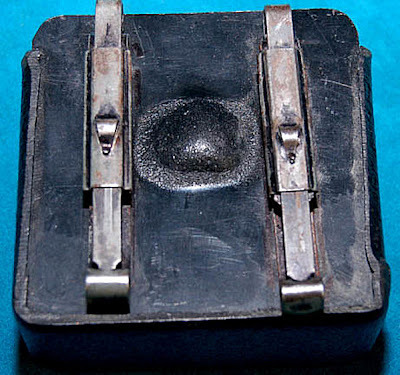 A variety of sensor antennae dot the outside of the item, some are broken off after a thirty year existence, but enough are intact or accompanying to retain the original appearance. 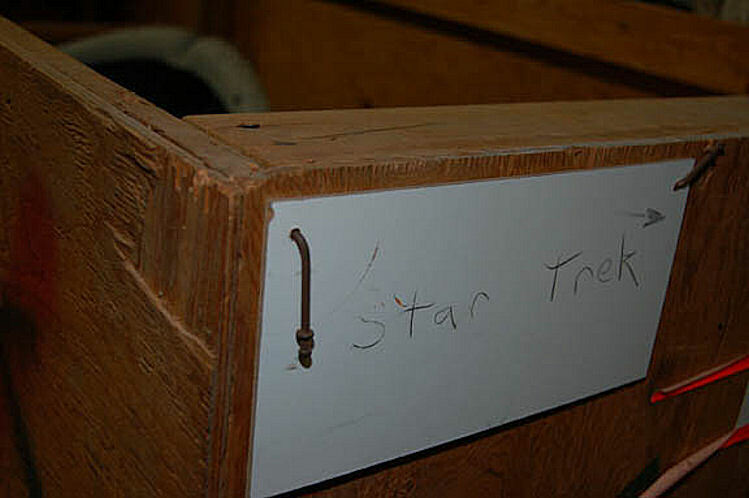 The item ships inside its own, original wooden crate, outfitted with wheels. 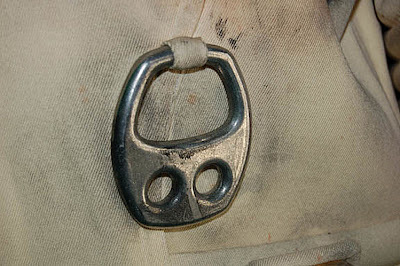 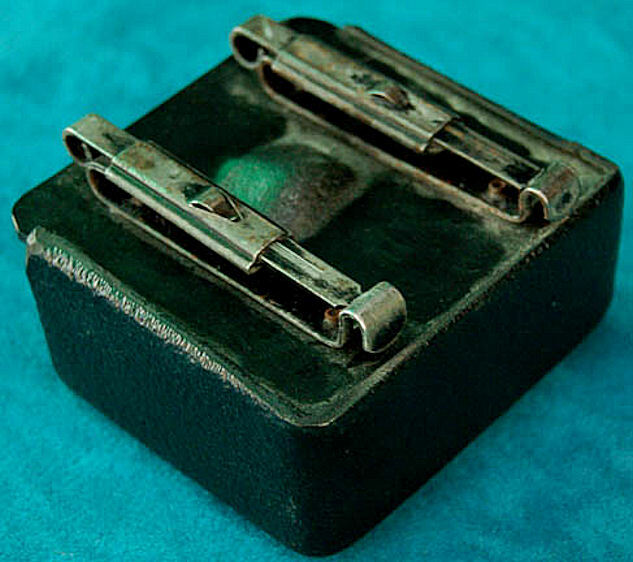 Some of the photographs used are screen captures from DVD in an effort to reproduce the item's original appearance, the close-ups indicate the level of intricate detail, and the item has been kept in its case upon location in an effort to prevent any danger to befall it. 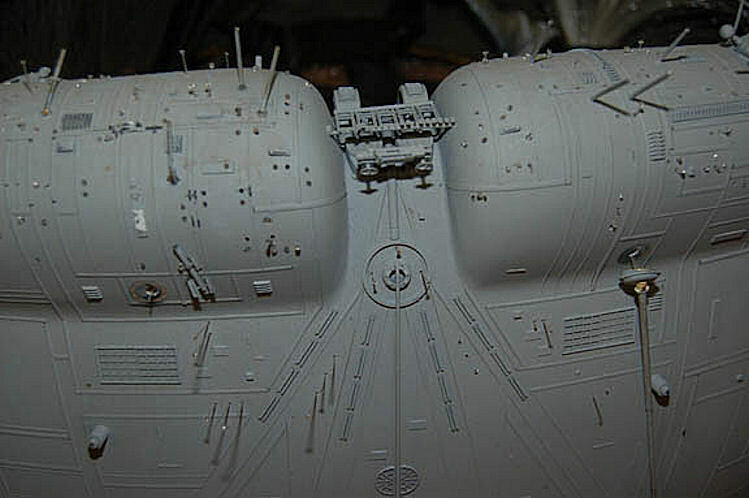 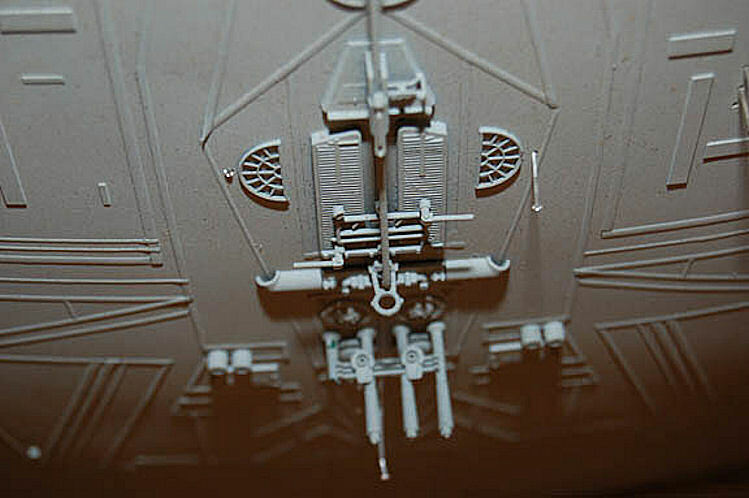 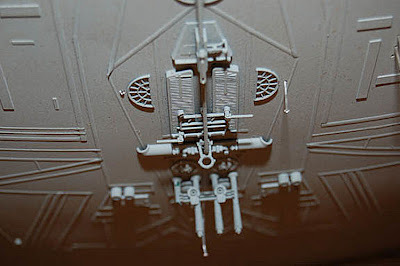 This one of a kind, model is one of the last of a dying breed, fully three dimensional movie models are much less cost effective than computer generated renderings and thus, this piece from a bygone era must be preserved. 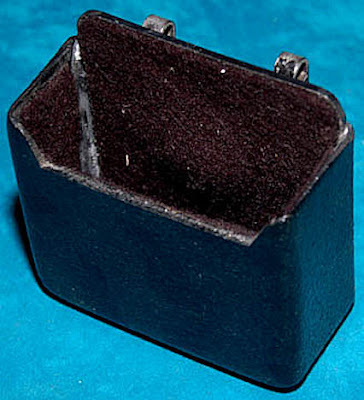 In its case, the item measures approx. 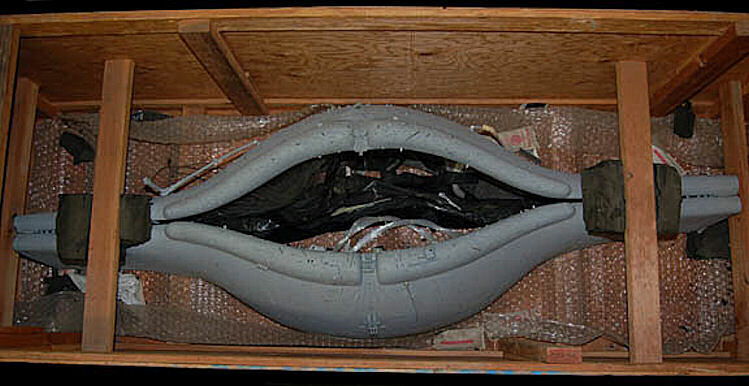 38.25 x 109 x 39.5 inches.